(Bronx, NY — July 29, 2015) – Bronx County District Attorney Robert Johnson announces the 217 count Grand Jury indictment of 23 alleged leaders and members of the UNTOUCHABLE GORILLA STONE NATION (UGSN) and theBLACK STONE GORILLA GANGSTAS (BSGG) – a set of the Bloods gang and its affiliates that operated throughout the Bronx, with an emphasis on Castle Hill and Co-op City. 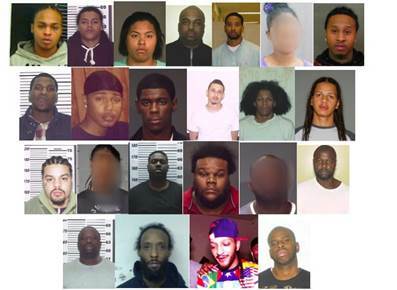 Dubbed OPERATION BLACK STONE, the NYPD made simultaneous arrests this morning of most of those who are charged. The most serious charges involve Attempted Murder, Conspiracy to Commit Murder, and Enterprise Corruption, under the New York State statutes that target organized crime and activities of criminal enterprises. It is alleged that, at the top level, was the UGSN. Under the jurisdiction of that umbrella organization were eight branches, known as “Kaves,” of which the BLACK STONE GORILLA GANGSTAS (BSGG) was one. Another was the GSG – GORILLA STONE GANGSTAS. A number of the defendants were arraigned in Bronx Supreme Court this afternoon before Justice Steven Barrett. Beginning in September of 2013, Detectives with the NYPD Bronx Gang Squad, working with the Rackets Bureau of the Bronx County District Attorney’s Office, initiated an investigation into narcotics trafficking and violence perpetrated by members of The Black Stone Gorilla Gangstas (“BSGG”) as well as other kaves, all organized under the Untouchable Gorilla Stone Nation (“UGSN”), a principal branch of the Bloods Gang. Starting in May of 2014, the investigation into the crimes of UGSN members included the use of court-approved wiretaps on an extensive number of cellular telephones belonging to a number of UGSN members. Evidence developed over the wiretapped telephones established a wide reaching criminal enterprise that engaged in a multitude of illegal criminal activities to generate income and exert control over particular areas within Bronx County, as well as other jurisdictions. The reach of UGSN, as determined during the course of the investigation, extended far beyond the borders of the Bronx. Over the wiretapped telephones, defendants were intercepted allegedly directly contacting fellow UGSN members in other jurisdictions, coordinating ongoing illegal activities on behalf of the criminal enterprise. It is also alleged they regularly discussed criminal activities of fellow gang members that had occurred in other New York counties or in other states. And, it is further alleged that some members of the UGSN regularly traveled to Maryland to commit crimes. The crimes perpetrated by UGSN members, amongst others, included an extensive number of illegal narcotics sales, possession and/or sale of illegal firearms, as well as violent criminal offenses and conspiracies to commit violent felonies. As detailed in the indictment, the crimes committed by the defendants were crimes committed on behalf of, and in furtherance of UGSN, a structured criminal organization with a defined hierarchy of leaders that demands strict allegiance by all its members. In fact, the UGSN employed a rigid hierarchical structure, which included positions ranging from top-ranked members to street soldiers. The case against the Operation Black Stone defendants is being prosecuted by Assistant District Attorneys Daniel Haines, Maureen Grosdidier and Thomas Boyle of the Bronx D.A.’s Rackets Bureau, with the help of Assistant D.A.s Vladimir Kocheulov and Ann Lee, under the supervision of Bureau Chief Stuart Levy, Counsel to the Investigations Division Mary Jo Blanchard, and Executive Assistant D.A. Thomas Leahy. The charges in this indictment are merely accusations and the defendants are presumed innocent until proven guilty.